Lucius Ferraris wrote in his Bibliothica Prompta (1763), which has been adopted as a standard of Roman Catholic law, as follows: "On account of the excellence of his supreme dignity, he is called Bishop of Bishops, Ordinary of Ordinaries, Universal Bishop of the Church, Bishop or Diocesan of the world, Divine Monarch, Supreme Emperor and King of Kings." "There are two powers, august Emperor, by which this world is chiefly ruled, namely, the sacred authority of the priests and the royal power. Of these that of the priests is the more weighty, since they have to render an account for even the kings of men in the divine judgment. You are also aware, dear son, that while you are permitted honorably to rule over human kind, yet in things divine you bow your head humbly before the leaders of the clergy and await from their hands the means of your salvation. In the reception and proper disposition of the heavenly mysteries you recognize that you should be subordinate rather than superior to the religious order, and that in these matters you depend on their judgment rather than wish to force them to follow your will." The King was recognized as having the right to invest bishops with secular authority ("by the lance") in the territories they governed, but not with sacred authority ("by ring and staff"); the result was that bishops owed allegiance in worldly matters both to the pope and to the king, for they were obligated to affirm the right of the sovereign to call upon them for military support, under his oath of fealty. Previous Holy Roman Emperors had thought it their right, granted by God, to name the Pope, as well as other Church officials, such as bishops. One long-delayed result was an end to the belief in the divine right of kings. A more immediate result of the Investiture struggle identified a proprietary right that adhered to sovereign territory, recognizing the right of kings to income from the territory of a vacant diocese and a basis for justifiable taxation. These rights lay outside feudalism, which defined authority in a hierarchy of personal relations, with only a loose relation to territory. The Pope emerged as a figure above and out of the direct control of the Holy Roman Emperor. Pontifix Maximus is a papal title meaning in Latin "chief bridge maker" between earth and heaven. However, Jesus Christ is the only One who can claim this title because "no man cometh unto the Father, but by me." John 14:6. This was a title of the Roman Caesars and of the Roman Emperors of paganism. Holy Father is a title the pope claims for himself. However, this title occurs only once in the Bible, and used when Jesus addresses His Heavenly Father in John 17:11 in His great prayer before His betrayal, arrest and crucifixion. Father is a title that every Roman Catholic priest claims for himself and expects to be called. Jesus warns in Matthew 23:9 "Call no man your father upon the earth: for one is your father which is in heaven." The catholic priest is not regarded in Scripture to be anyone's spiritual father. Monsignor This means "my Lord", and this clearly is a title belonging only to God, the Lord Jesus Christ. Reverend is a title of many Roman Catholic priests and Protestant ministers. This is also a title for God in Psalms 111:9 "Holy and Reverend is his name." It is blasphemy for any man to take to himself a title of God. "Mother of God" - Title given to Mary which denotes blasphemy, as it diverts worship to Mary. Mary was the mother of Jesus Christ's humanity, but not the mother of Jesus Christ's divinity. "Most Divine of all Heads." "Overseer of the Christian Religion." "Samuel in the Judicial Office." "Heir to the Apostles; Peter in Power." "Key-bearer of the Kingdom of Heaven." "Pontiff Appointed with Plenitude of Power." "Vicar of the Son of God." "Head of all the Holy Churches." "Chief of the Universal Church." "Ruler of the House of the Lord." "Apostolic Lord and Father of Fathers." "Rock against which the proud gates of hell prevail not." "Head of All the Holy Priests of God"
To be happy and prosperous, to have freedom from want and freedom from fear, a person, and also a nation, must follow King David's exhortation: "Rid me, and deliver me from the hand of strange children, whose mouth speaketh vanity, and their right hand is a right hand of falsehood" (Psalms 144:10). The Pope blesses with his right hand, a 'right hand of falsehood'. The Bible says: "All these blessings shall come on thee, and overtake thee, if thou shalt hearken unto the voice of the Lord thy God (Deut. 28:2).Friend, call upon the Lord Jesus,Christ to save you now, for He said: "Him that cometh to Me 1 will in no wise cast out (St. John 6:37). video: Cardinal Pacelli and the Roman Catholic Fascist "Church"
Pope John Paul II addresses the United Nations in 1995. See also: "UN General Assembly tribute to Pope John Paul II"
Pope John Paul II funeral with George H. W. Bush, George W. Bush, Bill Clinton and others. "Pre-papal Razinger became a Knight of Malta in 1999"
video: "Papa RATzinger You Cannot Hide Your Nazi Past"
with Matthew Festing and other SMOM members. Pope Ratzinger addresses the UN General Assembly on April 18, 2008. Pope Ratzinger blesses the UN flag, New York, April 18, 2008. Pope ratzinger at the 9/11-psyop World Trade Center site in 2008. Pope ratzinger at the papal mass in Yankee stadium in 2008. Note: the hidden phallic symbolism to the right. Pope Ratzinger and the ecumenical Eastern Orthodox Church patriarchs. Patriarch Bartholomew I and Pope Ratzinger. Prince Charles and Camilla Parker Bowles. "Controversy as Pope meets with Polish Anti-Semite"
Pope Ratzinger's US visit in 2008. Nancy Pelosi kissing the hand of Pope Ratzinger. Taro Aso and his wife Chikako Aso. Taro Aso is the first Catholic prime minister of Japan. Note:: the handsign, the Amanita muscaria mushroom / Saturn symbolism. Pope Ratzinger wears a red "Saturno hat" (or "Cappello romano"), inspired by the ringed planet Saturn, to shield himself from the sun as he waves to the crowd of faithful prior to his weekly general audience in St. Peter's Square at the Vatican Wednesday. Papal shield of Jorge Mario Bergoglio. John Mccain, (Cardinal and Knight of Malta) Edward Egan, Barack Obama during the annual Al Smith dinner (October 2008). Note: the persistent right/left position of Mcain and Obama - as 'two hands of the same body'. "American prelate of the Roman Catholic Church. He currently serves as the Archbishop of Boston, and was elevated to the cardinalate in 2006." "(born 1934) was a former Director of Advanced Space Programs Development for the U.S. Air Force in the Ford and Carter administrations, and a former United States Air Force Lieutenant Colonel with 101 combat missions. He holds a Ph.D. in Aeronautics and Nuclear Engineering from the California Institute of Technology. 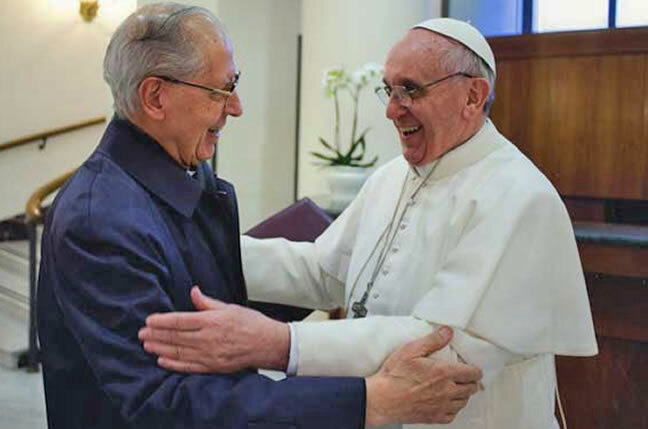 Bowman, the father of Robert M. Bowman, Jr., is the founder and Presiding Archbishop of the United Catholic Church, an "independent Catholic fellowship" created in 1996 and held to be connected through apostolic succession to the Old Catholic Church. Additionally, he is Executive Director of Christian Support Ministries. He also believes the US government was complicit in the September 11, 2001 attacks."